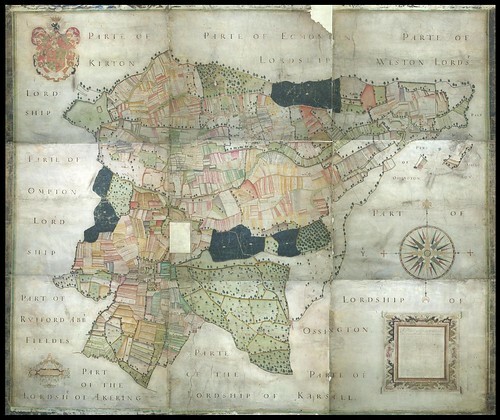 'A plat and description of the whole mannor & Lordship of Laxton with Laxton Moorehouse in ye county of Nottingham and also of the mannor & Lordship of Kneesall lying adiacent to ye aforesaid mannor of Laxton', by Mark Pierce, 1635. This map is actually in nine sheep skin segments which I've spliced together. There was some poetic licence taken in getting the borders to line up: this just means I made some adjustments to the non-map areas to get the best fit. Of course, the act of splicing will have introduced its own level of imprecision. 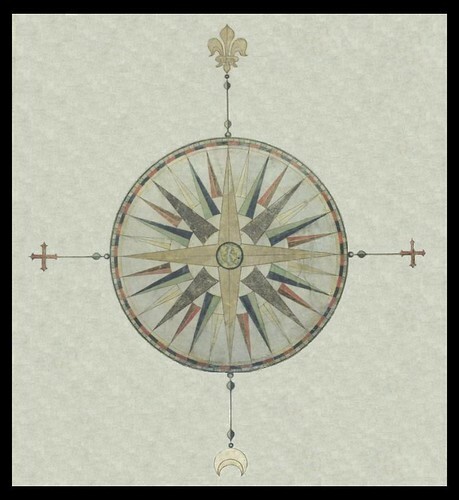 I mention this so that when you play with the google maps version below you don't draw the conclusion at times that Mark Pierce was anything but a first class cartographer - any occasional (and they are minor, I think) anomalies are at least as likely due to my own creative abilities with the stupid. In the 13th century, when Robin Hood was allegedly active, his fabled Sherwood Forest haunt (which at that time covered about a quarter of the County of Nottinghamshire) was within the administrative control of the nearby town of Laxton. The town was already well established when the Domesday Book* - the great census/survey of 1086 - was compiled, and unearthed Roman artifacts from local fields push the human history of the area back another six hundred years or more. But it's not the forest, nor even the legendary forest hero, that makes Laxton a location of significant geohistorical importance and a worthy subject for a post. The town happens to be the only remaining site in England which still operates a medieval open field farming system. This rather esoteric accolade isn't readily apparent if you pass by the local fields however. There's nothing at close quarters in a visual sense that communicates any sort of obvious specialness, and even farming experts have to keep a watchful eye out for the tell tale ridge and furrow features that distinguish parts of the locality as being unique. The farming system has practical consequences for the immediate environment of course but it's more conceptually about the land management governance - making map overlays and comparison the prime observational perspective. Basically, open farming refers to a cooperative or communal arrangement whereby land for cultivation is divided into strips and allotted to tenant farmers who each follow a strict annual crop rotation. 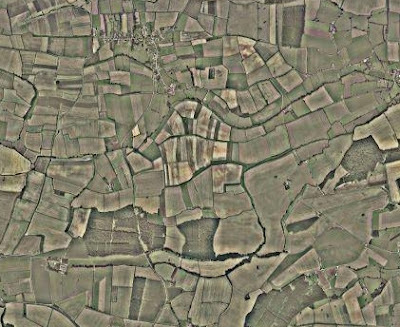 There are no fences or hedges to delineate segmental ownership and each tenant farmer has strips in the three surviving open farming fields in Laxton (nine hundred acres in total - as at 1902, which I'm fairly sure is still current), giving all of them varying grades of soil quality and favouring no farmer in particular. 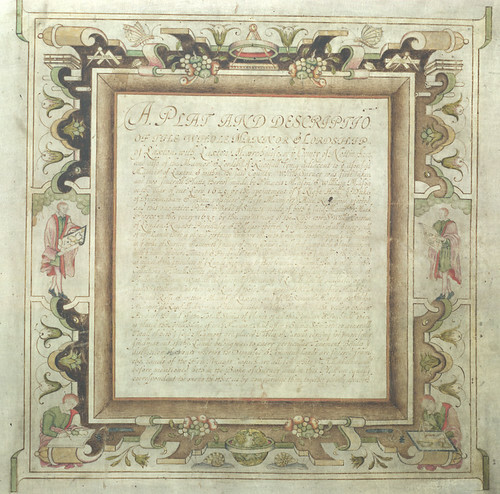 Traditionally, a manorial magistrate divided the land up each year (about thirty strips per family) and made decisions on the frequent disputes about encroachment onto a neighbour's territory. In a general sense, development of the strips for open farming probably relates to the types of clay soils common in North Western Europe that required use of a heavy plough pulled by a team of oxen. It was just logistically easier to plough long strips for an extended distance without having to turn the beasts around as often. The animal teams were expensive so they would be shared between village families. Et voila! Open farming agriculture. "In Tudor times, the larger and more influential landlords and tenant farmers consolidated the tiny, dispersed holdings into fields surrounded by hedgerows. 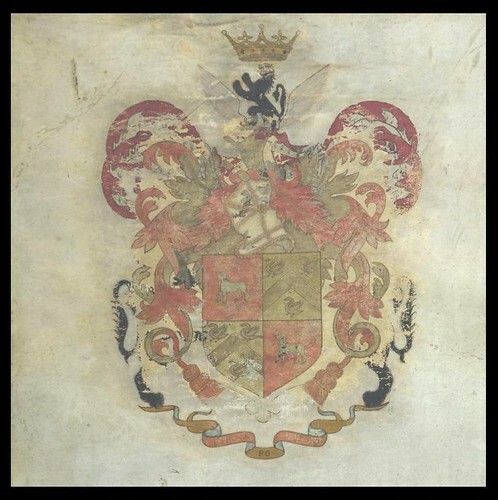 In the 18th century, new farming systems and advances in farm machinery propelled enclosure, keeping lawyers and surveyors busy and converting a large part of the English peasantry into landless farm labourers and factory fodder for the Industrial Revolution." The remarkable survival of this anachronistic practice in Laxton is due not so much to a desire to hold onto traditional farming methods (although that ultimately became the paramount consideration in the 20th century, prompting specific heritage protection and governance laws), but to the fact that the two major landowners, the Earl of Scarborough and Earl Manvers, couldn't reach agreement on how and where any land enclosures should take place in the early 19th century. From 1902: "There are many old words in use in the parish in connection with these fields, which no doubt are becoming obsolete, such as “sick” (or syke), “stenting,” &c. The former is a grass baulk, the latter the place where two “lands” abut on each other, and the person who ploughs last turns his plough and horses on the other man’s land, which is already ploughed, much to his detriment. How they all know their proper pieces is a marvel. There is an old saying in Laxton, that if you are first in the field with your harvest cart and last with your muck cart or plough, you are sure to be right. They are a peculiar people. The village is divided by the church into what are known as “up the street” and “down the street,” and these two parts are distinctly antagonistic to each other. The only time they combine is when a stranger ventures to take land in the parish, then they all pick him like a flock of crows." For the majority of the time that I've been assembling this post (read: playing with google earth) I didn't really know which bit of the Pierce map represented the open farming fields. 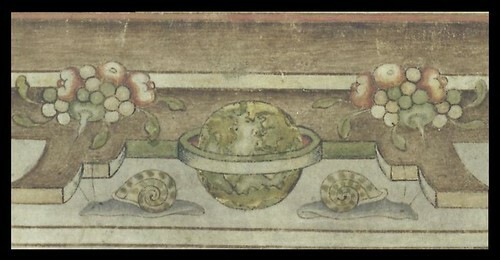 I had thought that they were adjacent to each other in that humped shape in the centre of the above image that includes what I imagined were the characteristic strips. It was that odd shaped field that I used as the feature for alignment of the overlay. It turns out I was both right and wrong.. It was just prior to posting this that I started to have a look around for some photographs (there are very few) and found the legend below. 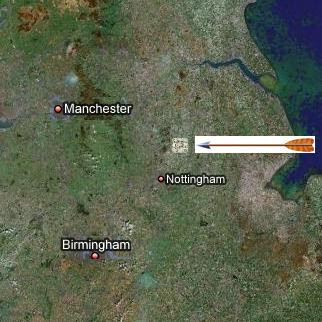 In a perfect world I would have tried to marry the legend up to the Pierce map from 1635 and to the satellite views. Alas, I'm too lazy by half. But it's a helpful indicator to bear in mind while looking at the overlay and sat-map. 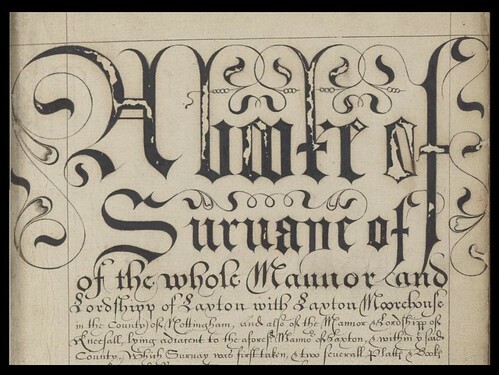 'A Booke of Survaye of the Whole Mannor and Lordshipp of Laxton with Laxton Moorehouse in the County of Nottingham' --- 'Manuscript terrier describing land tenure in the villages of Laxton and Kneesall, Nottinghamshire': also produced in 1635 to accompany the Pierce map. 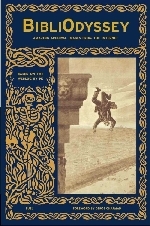 The Pierce Laxton Map and 'Booke of Survaye' are both hosted by the Oxford Digital Library: 'Bringing Laxton to Life: A Unique Insight into Feudal England' (click 'titles'). 'Farm for Rent, Would Suit Time Traveller' in The Independent, 1996. 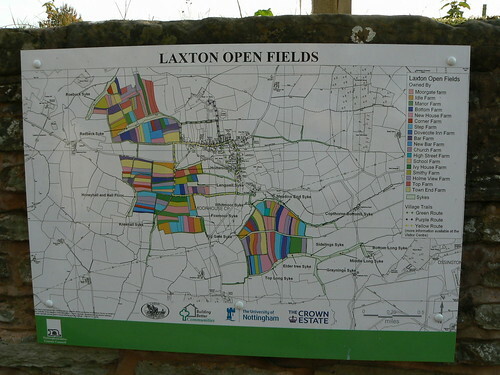 Wikipedia: Open Field System; Laxton Nottinghamshire.